I know I’ve talked about the eight limbs of yoga in a few posts, mostly in the context of saying that asana (yoga poses) is only one of the eight limbs of ashtanga yoga. 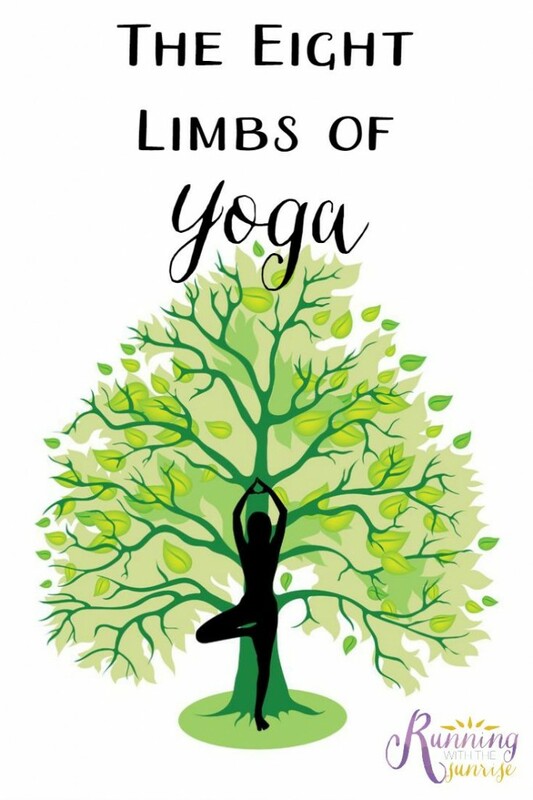 My goal for this post is to give you a quick overview of what those eight limbs are, for those of you who may be curious about learning more about yoga than you might already know. My hope is that knowing a little more about the philosophy behind yoga will help you deepen your yoga practice, either mentally, physically, or both. First, a little background about where the concept of the eight limbs of yoga came from. One of the core texts of yoga is the Yoga Sutras of Patanjali. (I think it’s required reading for any 200 hour teacher training that’s certified through Yoga Alliance.) The sutras dive into yogic philosophy in many ways, one of which is naming the eight limbs of yoga. 1. Yamas. There are five yamas, or restraints, according to Patanjali, things yogis should aspire to not do. Those five yamas are non-violence (ahimsa), non-lying (satya), non-stealing (asteya), non-sensuality (brahmacharya), and non-greed (aparigraha). Like any ancient philosophical text, there are different ways that yogis interpret the yamas. For example, some yogis take non-violence so seriously that they refrain from eating any animal products. Some remain celibate as a way of practicing non-sensuality. You get to choose how you interpret and apply the yamas to your everyday life. 2. Niyamas. The five niyamas, or observances, are things that yogis should do to in order to become good or virtuous. Those five niyamas are purity of mind, body, and the things we say (shaucha), contentment and acceptance (santosha), perseverance and austerity (tapas), introspection (svadhyaya), and study of the True Self (Ishvar-pranudhana). Again, there are slightly different ways to interpret each of the niyamas as you incorporate them into your life. 3. Asana. This is what we typically think of as Westerners when we think of yoga—the classic yoga poses. Yoga asanas are meant to help the practitioner deepen his or her entire yoga practice, finding a sense of inner peace and meditation and connection with the True Self. In the sutras, Patanjali writes that practicing an asana over time allows us to calm our minds and our relax bodies in that pose as we get stronger mentally and physically. This is one of the reasons why so many yoga practitioners use the word “practice” to describe the time they spend on their yoga mat—it truly is all about practicing asanas and the other limbs of yoga. 4. Pranayama. Prana is our breath, or life force, and pranayama is the practice of regulating the breath. We become conscious of our inhales and our exhales, how deep or long they are, the sensation of taking each breath. There are different pranayama practices, such as single nostril breathing, that you can delve into if you’re interested. Yoga Journal has an article on different views of pranayama that’s a great read if you want to learn more. 5. Pratyahara. Pratyahara is the practice of bringing your thoughts inward. Instead of focusing on the things you see or hear around you, you begin to instead bring your focus on your True Self. It goes beyond just closing your eyes or not touching things around you, instead, you focus on mentally letting go of the things you sense and instead focus inward. 6. Dharana. Dharana is concentration, or focus of the mind. Dharana is what happens when we slow down and stop our thoughts and hone our consciousness on one thing, whether it’s our breath or a mantra, or even a syllable like aum. As we practice dharana, we practice holding that focus in our minds and not letting our minds wander. 7. Dhyana. Dhyana is most often described as meditation. With dhyana you contemplate or observe what you focused on with dharana. For example, if you’re focusing on your breath during your meditation, you can consider how your lungs and chest feel as they expand and fill with air. There’s also a sense of non-attachment to self with dhyana—you stop thinking about who or what you are and you just are. 8. Samadhi. When I was doing my teacher training, samadhi was hard for me to understand at first. Samadhi can be described as oneness. It’s cessation of thought and being completely present in the moment. Just as dhyana builds on dharana, samadhi is the culmination of practicing dhyana. If you’re mediating on an object, you mentally become one with that object. Or, if you’re meditating without and object and you’re mentally facing inward, you come to a place of reflection, where you’re just focused on existing. I hope I’ve helped you learned a little more about the theory behind yoga! Or, I hope that you at least now understand that there’s so much more to yoga than practicing asanas. Please let me know if you have any questions that I can answer for you (maybe in future blog posts ;))! How do you practice yoga? Have you read (or even heard of) the Yoga Sutras? Thanks for sharing! I knew that yoga as we Westerners practice it didn’t encompass the full scope of yoga but I didn’t know what the limbs were specifically. Most of my practice is asana, but elements of the others sneak in as I practice controlling my breathing and concentrating on the current moment.